Thomas Becket was born in 1118 of Norman ancestry. He was educated at Merton Priory, Paris, Bolona, and Auxerre. He was a civil and canon lawyer, soldier and officer. He became the Archdeacon of Canterbury in 1154. In 1155 King Henry II made him his chancellor, and his influence was enhanced by his friendship with the king. In 1162 he was elected Archbishop of Canterbury at the instigation of the king, and accepted the office with reluctance, knowing a break to be inevitable. From then onwards Becket adopted a very austere style of life, resigned the chancellorship, and opposed the king's interference in ecclesiastical matters. He was exiled, staying with the Cistercians and then the Benedictines in France. He returned to England in 1170 and was received with popular enthusiasm. However, Henry's anger toward Becket continued and escalated with angry words spoken to four knights. The knights assassinated Becked in his cathedral on Decemer 29, 1170. 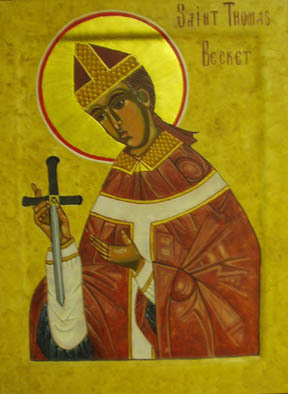 In this icon, Becket is portrayed in his Archbishop's vestments, cope and mitre, and is holding a dagger which was the instrument and symbol of his martyrdom. 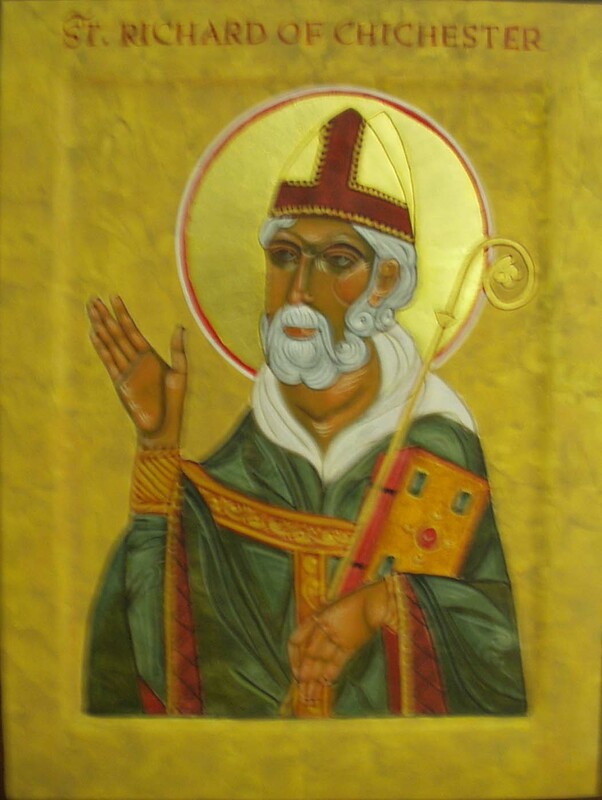 Richard, Bishop of Chichester (1245-1253), was a man of strong character, a scholar, but sensible and practical as well, energetic, kind, modest about his own powers, cheerful and courageous. Like Thomas Becket, he had problems with King Henry III. He loved people and was greatly beloved by them. He is remember for his prayer on his deathbed, sometimes called "Day by Day". For all the pains and insults you have borne for me. And follow you more nearly."